The memorial was assembled in 1938 to the design of Louis Naudi who was closely influenced by 20th century sculptor Antonio Sciortino. The square-faced obelisk was constructed entirely in Maltese lower globigerina limestone flairs, its design forming an obelisk in the form of a stylised cross with four stepped faces. It flairs out appropriately at the bottom to accommodate a commemorative plaque on each of its four faces. The design of the monument and its sheer scale is a rarity in Malta. This memorial was originally assembled dead centre between City Gate and another road leading to Ġlormu Cassar Avenue. It was relocated after careful reconsideration by town planners Harrison and Hubbard during the post war relining of St Anne Street and the reconstruction of new buildings elongating the avenue. The exercise was aimed at keeping the monument centrally aligned on an axis through the centre of St Anne Street. 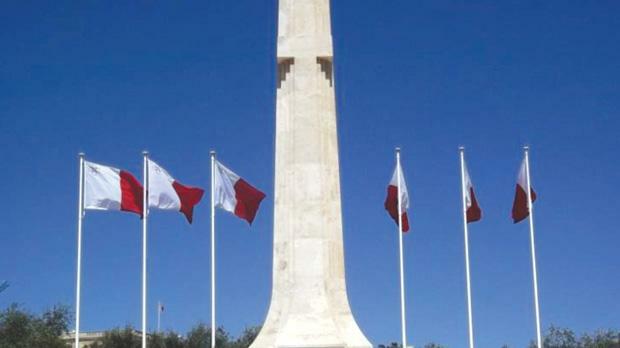 Mepa scheduled the War Memorial as a Grade 1 national monument as per Government Notice number 522/12 in the Government Gazette dated May 8.